I purchased a .125" x 2" x 18" piece of O-1 (oil hardening) tool steel from MSC Direct to make the blade for the spill plane. I'm making the plane iron for several reasons: 1) it's less expensive than buying a finished one, 2) it's something to blog about, and 3) I'm trying to overcome my fear of propane torches. After shaping the blade, I'll temper it with propane & mapp torches. I have done this several times before but every time I do, I'm convinced the tanks will blow up in my face and I'll have to change my blog name to The Village Dark(wo)man. Dab layout fluid onto the steel and mark your cut. I like a rounded end on an iron, so I used a compass with a pencil. You can also mark it with an awl. 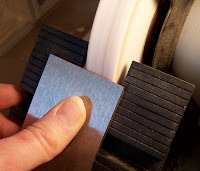 Rough cut the shape with a hacksaw and clean it up on a grinder. Incidentally, if your grinder is not shooting sparks, it has glazed over and you need to redress it. 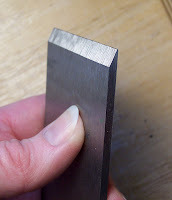 I ground a 25 degree bevel on the cutting edge, but did not grind it sharp so that the end is not so fragile when I torch it . 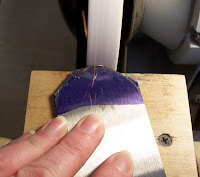 At this point, you do not have to be careful about overheating the blade since it still needs to be tempered.